Jeff Bezos and anyone else holding Amazon stock must be pretty happy this past week after seeing the stock shoot up 15 % as the last quarter revenue was up 34%. Grwoth and performance are the cats’s meow in capital markets! But Amazon is afterall just an internet company, right? Steve Henn of NPR interviewed Ben Rose, president of Battle Road Research who offered a little perspective. while Amazon made $190 million dollars in profits last quarter – McDonald’s, which is now worth less on the stock market, earned more than 1.2 billion. .. the reason so many investors are excited about Amazon is that it is growing – fast. Fast growth means a lot to the street, investors as well as senior managegment. The double hockey stick, or ability to repeat performance over time before hitting the point of stagnation sounds precisely in keeping with our expectation of CEOs and yet their inability to knock them out of the park consistently puts Bezos into a very exclusive class. The difference in earnings for Amazon and McDonalds illustrate that there’s a lot more to the picture. Rapid growth requires more than stepped up demand, but an ability to also step up quality, supply and delivery efficiency, generate positive experiences while sustaining your reputation increasingly matters. For years, McDonald’s strategy for growth emphasized opening more restaurants to reach more customers. The problem was that as the efficiencies from scale began to stagnate , flattening the upward trajectory of the growth curve. As masters of scale and efficiency and even quality, the price advantage certainly helped them during the recession but by their own standards of success they recognized they needed to do more. They turned to their innovation team and began to set in motion a series of tests that not only allowed them to upp sales per customer but returned their growth rates to an upward trajectory. Design helped them completely shift their thinking and relinquish some of the central control and dictates allowing the individual outlets flexibility to satisfy the local tastes and prefrences from menu items to the restaurant design itself. The shift from central to decentralized control is not merely the return of the pendulum swing. John Kotter, writing for Forbes, observing the ever-increasing rate of change and the inability of many organizations to thrive, also observed that static management principles stymie timely transformations. What stops organizations from adapting or flexibly responding to the larger dynamics at work in the market? 20th-century, capital “H” Hierarchy (a sort of hardware) and the managerial processes that run on it (a sort of software) do not handle transformation well. I read this comment and immediately began to understand something I had failed to grasp. It’s easy as an outsider to recognize and empathize with the challenges of an organization whose leadership voice the words and know deeply they they need some of that innovation. I thought it was thier lack of vision, or their inability to appreciate and value the customer experience or a series of solutions that have been echoed in innovation circles by business strategy, design thinking and change management professionals. What I missed was a lesson I had learned and quickly forgotten because it was a painful chapter when I worked for Fortune 50 banks and found myslef the change agent. Most managemetn teams are responsive up the chain, and in my experience the marching orders they followed were reinforced with clear rewards for delivering performance. Getting to the C Suite requires making all the right moves, delivering the results that were expected and that’s the system you know. The trend to outsource was an innovation to cost reductions and creating efficienciey when what mattered was being lean and oil was bad for your diet. Consumers adapted becasue they never did know the difference between a local company paid customer service rep who spoke english and seemed to know the score and one paid by an outsource firm and could repeat the tasks for multiple companies. The price for that efficiency is the loss of control, the ability to truly be agile, nimble and responsive to shifts in the market. You may have surrendered to the forces that Joe Pine describes commodotized your business, swapping out tasks to experts while stepping up the your investment in the new new thing. The entrepreneurs who are running circles around the larger providers can do it becasue either they control every inch of their value chain, or the are able to begin by leveraging technology that is fully integrated, seamless and allows for transparency across the system. Its unclear how long Amazon will be able to keep up their growth rates by challenging new business sectors failing to make the transition. Revisiting your structure and decision-making hierarchy certainly helps …. Finding hidden treasure in plain sight. Prospecting, mining both are familiars metaphors describing the activities associated with finding and developing resource rich opportunities. Rarely in plain sight for any passerby to scoop up and gain advantage, prospecting for Gold, other metals or precious gems like diamonds require active and often deep digging capabilities. Like precious metals or gems, the secret to good business is creating precious assets of intrinsic value. The attributes to value when known for durability and uniqueness, such as a brand, retain value over time, predictably generate cash flow and become difficult for competitors to acquire. But the uncertainty of today’s markets and the disruptive threat of new technologies can quickly erode the value of any asset and so growth is essential. Whether your strategy calls for acquisition or organic growth, either way, the underlying development and prospecting costs need to be contained. In stories and legends, merely having a treasure map and knowing where to dig doesn’t always lead to happy endings. Technology has certainly helped to mitigate the risks or advance probabilities of success. Ground and water penetrating radar and detectors discriminate ferrous and non-ferrous metals pinpoint the site to begin mining and improves the probabilities of a fruitful yield. The challenges in any mining activity depend not on the power of the technology or in making the dig profitable. Today’s WSJ headline reads Gold hits $1,700. Absent reliable, hidden treasure maps knowing where to look is an advantage. Returns depend on offsetting the difficulty and risks associated with its extraction and the quality or grade found. Forbes recently summed this up USAGX’s Denbow: Gold-Mining Companies Face Challenges Finding New Supply. Prospecting is a perennial challenge for any and every business, and managing the costs is the key to delivering returns. The current market turmoil has done more than merely increase investors uncertainty. for the Risk averse, who have shied away from innovation or the adventurous business who has wisely taken pause, I suggest this is a great time to revisit your strategies. Standing still can prove surprisingly advantageous if in the process of cleaning house you discover undervalued or even overlooked assets. What value does an earlier project, research or failed product launch buried for any number of reasons offer? Lance and Scott Bettencourt of Strategyn write in Harvard Business Review in June 2011 Innovating on the cheap a series of suggestions on how you can leverage your existing assets, or rediscover value in surprising places. I suggest a process that may take you a little further. Consider Google’s Search business and the underlying value of its algorithms and index. Maintaining these assets is of critical importance but so too is the value of constant improvement. Daily, new content and pages added to the internet require Google’s index continuous update. Including rich and diverse content such as images, video and sound files on the internet challenges Google’s index and algorithm update to accurately rank and deliver the results. Realized innovations continuously contribute to Google’s financial performance and persistent high market valuation. Even Google however has failures. Research, experiences of both internal and external users generate additional assets hidden in plain sight. Actively sharing and reflecting on the meaning of both successes and failures allow new project teams ready access to key insights that otherwise would be left to lie fallow collecting dust. If Google continues to draw value or benefit from their latent assets, can you? Frequently, environmental conditions change a variable’s significance. Strategyn authors talk about unrealized value in products that may have been premature for the market, experienced formidable technical difficulties or their launch prevented by high manufacturing costs . Nothing stays constant anymore. Consumers are always adapting their preferences to changing circumstances and environmental conditions, and business are equally forced to adapt. A variable’s significance in your business model in one moment may prove insignificant later. Persistently changing conditions is why its’ important to frequently revisit your tactical plan and forecast models; and occasionally revisit your business model/strategy. In 1984, Jesse Jackson was the first Black American to run for President. I was an assistant statistician working for CBS News assigned to use the exit poll and early returns to create prediction models to track trends in voters behavior. Race became a significant variable , where as before it had not been much of a determinant factor. To increase accuracy, the forecast model needed to adjust to accommodate and recognize this historic precedent. Likewise, when I joined Citibank in 1985, the business needed a P &L model for an innovative new offering in four test markets that linked savings and credit products in a relationship. No one had looked at interactive product performance before and the experience was a revelation. The adaptation to existing analysis and risk management tools were instrumental contributors to the explosive growth of Citibank’s credit card business. The original business proposition failed to consider that the risk in a bundled loan or relationship, product was not merely additive but interactive. Early, controlled testing allowed them to go back to the drawing board armed with new insights and better understanding of the boundaries. New data is rarely the culprit in a failure; but as things change, more data enhances interpretation and provides insights to re-imagine your business. When you are the largest issuer of credit cards in the world, accurate risk models can be built using available billing histories. In the 1990’s mountains of itemized purchase or transaction level was left untouched, though its potential value was clear, there were no clear benefits to justify the monumental costs of analysis. This was a treasure waiting to be mined. Lacking urgency or absent a competitive threat also minimized the value of uncovering additional insights into consumer’s behavior. Fast forward just under 25 years and the costs of time and computing resources to sort high volumes of transaction data is trivial and the returns from real-time processing lucrative. Mined transaction data triggers fraud alerts and delivers additional purchase suggestions based on comparison to individual consumer history and that associated with cohorts, peers or “friends.” Amazon demonstrates mastery in mining typical point of sale enhancements and redeems enormous value from its dual function processing. Opportunities and technology capable of mining even richer, more complex data eclipses the significant value accrued from mining transactions. The potential value is driving the collection and complex tagging and sorting of recorded customer service conversations, video capture of consumers shopping or following their daily routine at work or at home or all the places they go online, key strokes, eye tracking, written comments. It appears that there are very few domains of human experience and activity that remain a hold out from data capture. The number of matching and sorting tools, the algorithms and systems also are getting simpler and more widely accessible. Today, the speed and volume of results Google returns in a general search is far more advanced than credit card billing records I analyzed. When was the last time you checked out Google’s specialized search tools or the technology coming out of their labs? The insurmountable challenges are no longer in finding available data, or even privacy. Its ubiquity and increasing open source availability creates an even bigger challenge, turning the vast amount of real-time data into a durable advantage. Sunday’s New York Times (August 7, 2011) reported the unusual establishment in Chicago of a team of specialists tasked to help Chicago harness the technology and gamut of rich data the city collects. Not alone in its efforts, Chicago is farther ahead of other governments in creating easy interfaces that contribute to the public’s use of its treasures of recorded and collected data. Transparency adds more value by increasing the number of analyst reviewing the information, spotting trends or creating applications that simplify the lives of residents. For example, the free Bus tracker application to let riders and plan their trip better. It also holds his office more accountable and increases the opportunity for activism by city residents. There’s no doubt that power accrues to those who can imaginatively convert data into both meaningful and doable innovation. Today’s data mining technologies facilitates more than accountability and activism. Beyond knowledge of the type and place of available data, a dedicated commitment to sift and mine the growing mountains of data requires critical analysis and matching skills. Google does not stand alone in its specialized capabilities, numerous competitors offer diverse and specialized alternative search tools. Numerous open source tools make it easy to sort and manipulate any of the open data made available online. As in prospecting, the tools and ability may narrow the competition and may advance the process. But those systems capable of exploiting and enhancing anomalies with supplementary information increase their chances to uncover intrinsic value and thus create durable advantage . Innovation results from capabilities to invent but can equally result from abstraction and adaptation. Most of us at one time or another have come across a person who managed to re-purpose or refashion an object for an alternative use. 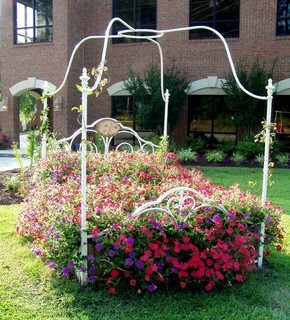 For example, the flower bed below. If images are worth a thousand words, spying consumers who refashion or use products for purposes beyond the manufacturer’s original conception can prove inspiring. Conversations and story are at the core of social media’s power. The words of mouth, or stories associated with transmitting and promoting your business also motivate, inspire and compel employees to higher performance and deliver insights into how your product can be improved. How often are you using these to find products in your inventory or services, that you may over overlooked or underestimated, but are important to a group of consumers? Sales Data–Data mining tools can be used to find surprising blips, if you look beyond the blip. Focus your analysis on the less understood context such as coincident placements or other variables that may not have made it into your database but none the less explain the anomaly. They may very well be the source of an unrealized opportunity to refashion and reposition products that have trailed in sales. Last, perhaps you need to apply data mining tools on your own data collections. The files of failures, tucked into drawers or file cabinets, the product research and or launches that never saw the light of day may call for another look. After all, consumer preferences are always evolving, but so are your competitors, as well technology that may allow you to overcome previous cost barriers. For example, oil and gold extraction from very difficult places is now proving economically viable as both these commodities benefit from high market prices. More reason to harness data mining technologies to jump-start innovation in product marketing, reuse or refashion your assets to generate additional cash flow. I’d love to hear of your experiences recapturing value in your business by any other routes as well as suggestions for good tools or tips to improve your data mining or prospecting success.